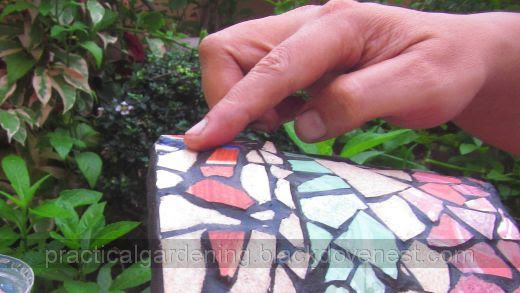 If you don't like the color of the grout used in the mosaic garden pot, you could still change it, provided the grout has not yet been sealed with a grout sealer or any other sealant. The finished project gray-colored grout looked good, but I thought a darker colored grout would look even better. A black-colored grout would definitely provide contrast to the the light color of the tiles and therefore highlight them more. In general, black-colored grout is better for most tile colors - in general. If I had the choice, I would have skipped the gray grout and simply used the black-colored grout right at the start. 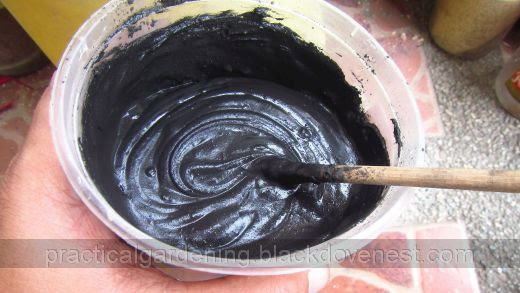 Using a stick or spatula, make a mixture of the black grout with a little water to achieve a pasty peanut butter consistency. Follow the grout's package label instructions for more details. When the grout is ready, liberally smear it along the joints as shown below. 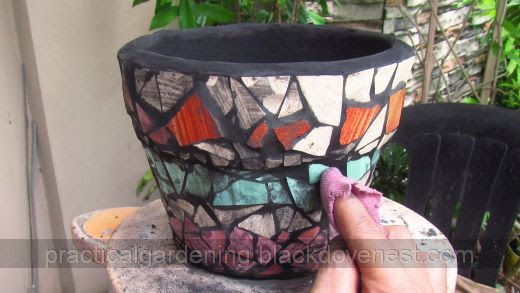 For an overall even-looking appearance, apply the black grout along the top rim and about 3 or 4 inches deep inside the garden clay pot. As in the procedure for applying the gray colored grout, apply a water-soaked sponge to remove the excess black-colored grout. 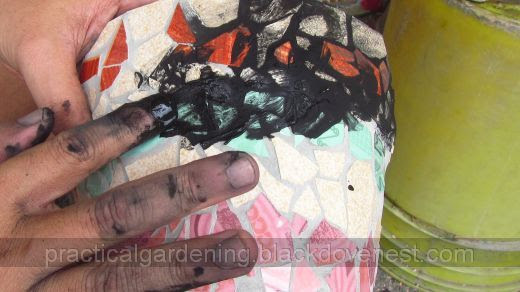 Let the black colored grout dry overnight. There will be black haze that will form on the tiles' surface. Remove this by wiping with a wet rag. Avoid touching the black grout on the joints. 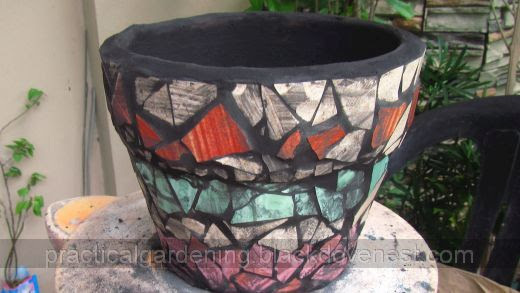 The thin grout applied on the inside of the pot may not thoroughly adhere. This is annoying as it comes off as powder and sticks to your hand and fingers. 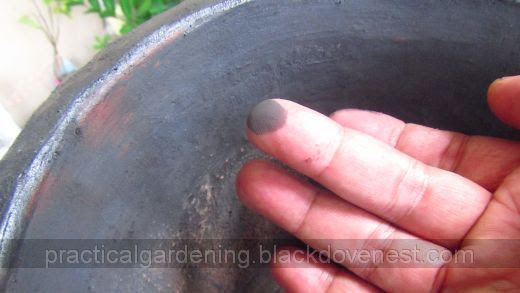 It may appear as soot when the pot is handled as shown below. You could use grout sealer to coat this film of grout. Grout sealer can be expensive though and I used a more inexpensive alternative. 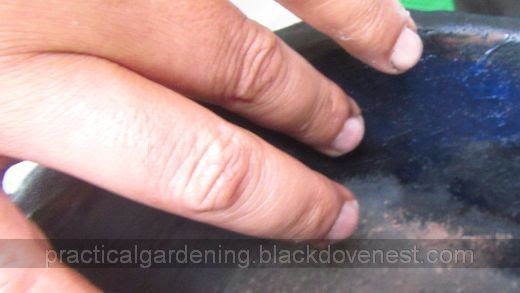 This is a thin water-based elastomeric sealant and has the consistency of latex paint. It could be applied using a paintbrush. 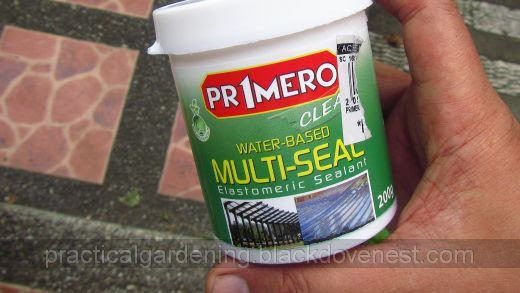 Scoop a little of this elastomeric sealant with your finger and spread thinly on the inside, top rim and bottom edge of the garden clay pot. Cover these open areas that have been grouted. You could use a clear colored sealant or a color that is the same as the grout (black in this case). 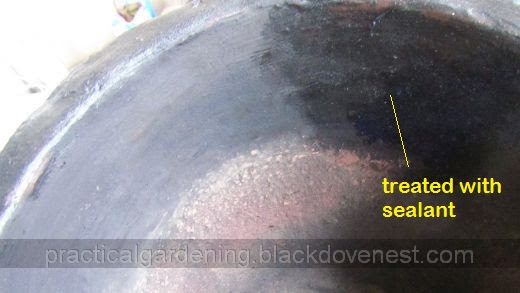 Here is the inside of the clay garden pot where the elastomeric sealant has been treated on the grout. The treated area has dried and now looks glossy. It is also a bit smooth to the touch. The sealant coats the grout and keeps it there. 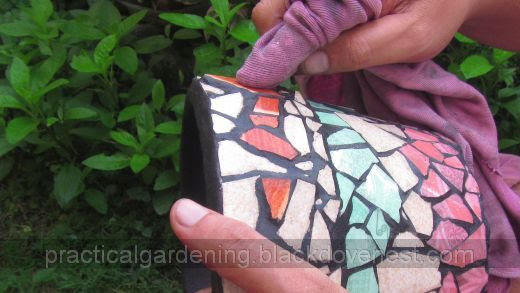 There is now no more powdery grout that clings to your fingers when handling the pot. For the grout on the joints where the tile pieces meet, it is better to apply grout sealer. Grout sealer has the consistency of milk and can be sprayed. For this project, put a little grout sealer in a shallow container. 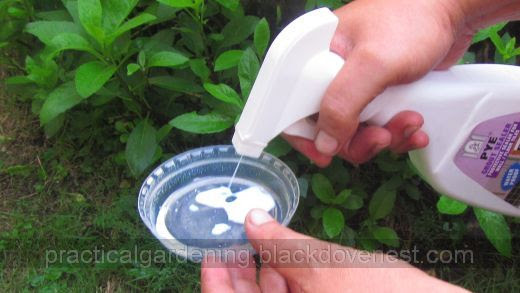 Spraying grout sealer is not economical as much of it goes to the tiles which you don't want. So dab your finger into the grout sealer. Apply the grout sealer with your finger on the grout on the joints. Avoid spreading into the tile pieces. Wipe off any grout sealer that was misapplied on the tile pieces with a wet rag. Let the grout sealer dry overnight.